Kroger deals week of 4/15 THRU 4/27!!! It's a Buy 4 save $4 MEGA SALE!!!! New to Kroger?? Check out our Kroger 101 tutorial that will help you learn the ropes of shopping at Kroger. Don't forget to load your Kroger Digital e-coupons and Savingstar offers to your shopper's card before you shop! To Read the Corporate coupon policy online, go HERE and read it. Thisis the SECOND and final week for the Buy 4 Save $4 MEGA SALE!!! 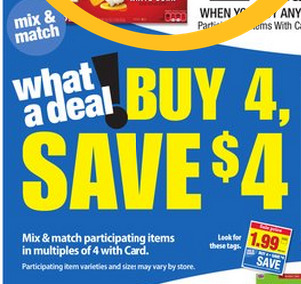 Mix and match participating items in multiples of 4 and save $4 instantly at the register. The final prices listed below reflect the extra $1 savings assuming you buy in multiples of 4. ALERT!!! Don't forget to print off this mail in rebate for FREE GROUND BEEF (up to $8.06) WYB 3 Helper meals!!! It's a great on to take advantage of with Grilling season coming up!! Final cost: $1.49 <--- great price! Final cost: $1.49 each <-- good price on these! Final cost: $1.49 <--- great price!!! Final cost: as low as $.99¢ <--- stock up price! Final cost: $0.79 <----stock up price!!! Final cost: $0.99¢ <--- great price!! Final cost: $1.99 <--- stock up price!!! Final cost: $1.49<--- stock up price!!! This cheese freezes very well!!! Final cost is as low as $1.49 <--- stock up price!!! This cheese freezes very well!!! Final cost: as low as $1.49 each <--- great price!!! Nabisco snack saks, 8 oz - $.88¢ each <--- stock up price!!! ^^^some are finding tearpads and peelies for these, so be on the lookout! Final cost: $1.09 each <--- stock up price!!! Final cost: $1.99 <-- pretty good price on these! Final cost: $0.99¢ each! <--- stock up price!!! Final cost is $0.69 each <--- stock up price!!! Final cost: as low as $0.86 each <--- stock up price!!! Final cost: $1.24 each <--- stock up price for this brand!!! Gatorade - 8pk, 20 oz bottles - $4.49 (.56¢ per bottle) <--- stock up price!!! Pepsi or Dr Pepper 6pk bottles or Pepsi 8 pk cans - $1.99 (.33¢ per bottle or .25¢ per can) <--- stock up price!!! Country time or kool aid drink mix - $.88¢ each <--- stock up price! Final cost: $5.49 <--- pretty good price! Final cost: as low as $3.99! <--- great price!!! Final cost: $1.79 <--- stock up price!!! Final cost: $1.99 each <--- Stock up price!! Final cost is $2.99 <--- stock up price!!! Final cost: as low as $0.74¢ each <--- stock up price!!! Final cost: $1.99 <--- Great price!!! Final cost: as low as $0.84 each <--- stock up price!!! Final cost: as low as $0.54 each <--- stock up price!!! Final cost: as low as $0.74 each <--- stock up price! Final cost: as low as $1.99 <--- stock up price!!! Sun laundry detergent - $.99¢ <--- great price of you can use this brand!!! Final cost: $0.49¢ each <---- great price!! Final cost: as low as $1.24 each <--- stock up price!!! Final cost is $1.29 each <--- pretty good price for this brand! Final cost: as low as $1.74 <--- stock up price!! Final cost: $0.49¢ <--- great price!!! Final cost is as low as $1.39 <--- stock up price!!! Final cost: $0.99¢ <--- stock up price!!! Pampers Baby Wipes (64-72 ct) – $1.49 <--- good price- let's hope for a coupon!